Even though our locations may seem random at times, God has you and me where we are for a reason. Here are 3 ways you can make the most of where you live. We’d recently moved from Springfield, Missouri, to Atlanta, Georgia. Since we arrived, my girls and I had explored at least half of the metro Atlanta area. While my out-and-about-ness with four kids may have seemed adventurous to some, by this point in my life, exploration had become the norm. The thing is, after living in four states in two years – and yes, having four different driver’s license pictures – I’d learned to carpe urbem. You know, “seize the city.” I’d figured out ways to make the most of the places, as Dr. Seuss would say, I’ll go. You see, by the second move, I’d determined that from making friends to taking in the sights, I never wanted to look back and think, “I really wish I would have…” I wanted to live with no regrets in the event I had to face another Penske moving van. What about you? Do you simply live somewhere or do you carpe urbem? 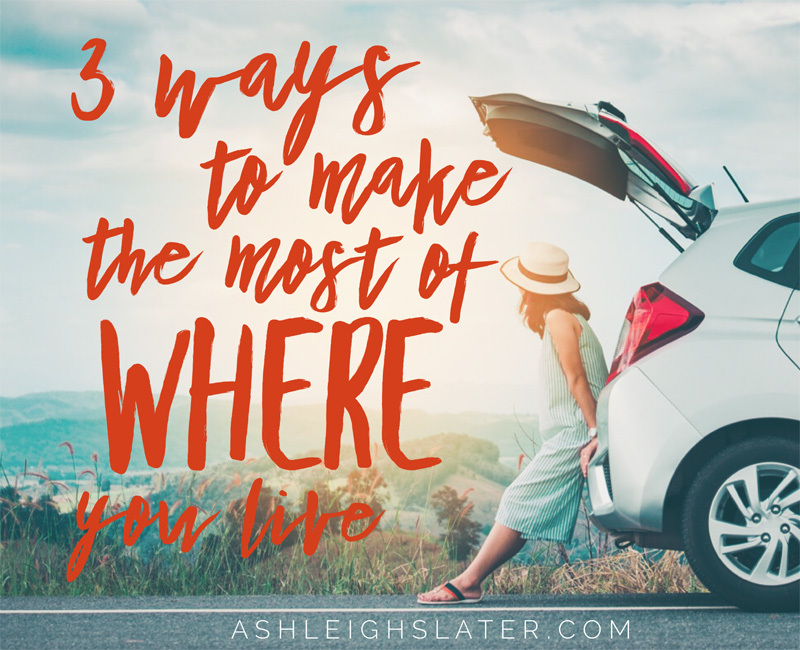 When we make the most of where we live, we are choosing to live life abundantly. So whether you’ve lived where you are for a few weeks or several years, like me, you can probably do better at “appreciating all there is in such a position.” Here are some ways I’ve put this into practice. First, I simply get out. Get out of my house. Get out of my comfort zone. While it’s good to exercise wisdom – for example, there are parts of Atlanta I know better than to venture to on my own – I don’t let fear keep me from exploring a new part of the city. I discovered the church we now call home when I passed it one day. I also noticed a state park near us, which we went on to discover had lakes, free summer bluegrass concerts, and lots of scenic walking paths … on a drive. Even if you’ve lived someplace for years, you can still get out and get bold. You can explore new places and make new friends. And once I am out, I don’t keep to myself. I strike up conversations. I’m not afraid to engage, in a wise manner, those with whom I come in contact. We first met a family I now consider dear friends while in line at a puppet show. Nine months later, we regularly get together for play dates, go out to lunch, and lift one another up in prayer. Second, I use word of mouth, Facebook, and coupon sites such as Groupon, Living Social, and Entertainment.com to find out what’s unique to our area. Word of mouth. If I want to know a good playground or a tasty off-the-beaten path restaurant, I ask someone whose opinion – and, when it comes to food, palate – I trust. If I’m in a new-to-me part of town and don’t have friends that frequent that neighborhood, I stop in a local shop and ask for options. While living in Colorado Springs, we found one of our favorite Mexican joints this way. Even in our age of iPhone apps teeming with reviews, word of mouth is an invaluable resource! Facebook. If you’re new to town and don’t have any mouths to ask, there’s always Facebook. Once I move to an area, I “like” the Facebook pages of area attractions, whether it’s the area home school group, the local history museum, or the performing arts center. This way, things to do – and free activities – are fed to me on my Facebook home page. For example, when we moved to Atlanta, I discovered a Facebook page for “Atlanta Moms on the Move.” It’s been wonderful in pointing me to family friendly things to do. Coupon sites. Sites such as Groupon.com, LivingSocial.com, and Entertainment.com are more ways to bring ideas and deals to your “door,” so to speak. Not only did I discover the Center for Puppetry Arts, one of our favorite places in Atlanta, through the Entertainment Coupon Book, but I saved money in the process. With each move, we’ve been purposeful in finding a church home. And even though we’ve had to say goodbye to a few churches in the last two years, we’ve made relationships in them that we still maintain today. No matter where you find yourself today – whether it’s a location you love or loathe – take Chesterton’s advice to heart and make the most of it. I’m doing it, you can do it. Wake up each morning ready to carpe urbem! A version of this article was originally posted at iBelieve.com in June 2013. You can find that here.